Great location and facilities, thx! First let me say that we search out top rated parks and have stayed in many. Do not be deceived, this is no 10/10/10 as we have come to expect. Pro: Very beautiful setting Quiet Some sites with fantastic view but beware, not all. Easy access to river Great hiking in the area Great hot springs in the area Beautiful waterfalls a short drive away Con: Entrance is a typical perm park Poorly maintained landscaping...dead plants, dead grass, scrub and weeds growing to block river view, dead trees and shrubs Most laundry machines out of order for entire stay Never saw any employees cleaning anything, vacated sites, landscape, cobwebs all over entrance to showers and laundry The train might bother some, we did not mind Swimming pool located across the bridge in Perm park The worst: Early morning arrival of neighbors, a noisy group waking us up. It turns out to be a travel trailer covered with green scum. When they hook up water stated flying from everywhere so they proceed (all of them in loud voice) to tear into the water heater, plumbing etc. scattered all over next to our picnic table. Then they proceed to wash the green muck all over the place...what 10/10/10 park allows washing? Especially major? And, the rig had no licence plate nor temp registration. Point is, do they not look at what they are letting in? Do they never drive the park and check what is going on? Doesn't seem like it. To be fair, they do check to make sure you don't have a rug on the dead lawn because it might kill it!!!! Frist let me state that I am probably more critical of RV parks than most… Pros: Quiet park (except for nearby train tracks) Directly on the river Super friendly staff Long paved spaces Cons: Not much to do other than fishing Park not maintained in areas Extremely poor Wi-Fi service Details: This is a highly rated park by Good Sam so I expected the best of the best. Unfortunately, while it is a nice park, I found it lacking in a few areas. The two staff people I spoke to were extremely friendly and were genuinely concerned about providing a good experience. That said I was disappointed to see that parts of the park were in need of maintenance. Some spots were clearly better maintained than others. Most had grass and plants separating the spaces. However some had dead grass or dirt and dead plants… as if the sprinklers stopped working and they never bothered or cared to fix it. Secondly they list having a dog exercise area. Unfortunately, that area had obviously not been maintained for years. (The wire fence was rusted through with huge open spots that any small or medium size dog could fit through. The fence was only held by one working hinge and could not be closed.) Third major complaint is that the wireless internet service is so poor, I felt that AOL dial-up service from the 90’s would have performed better. Each device must be registered separately, so one would assume that no one guest could “hog” all of the bandwidth. Yet it was so slow, regardless of time of day or night, that even text based emails would take many seconds to send. And forget trying to load any webpage… that would take many minutes if it would load at all. A standard HTML page would take like 5 minutes to load! And we were parked directly next to one of their servers, so we had full signal strength. Just unacceptable. Lastly, not all spaces are created equal here. Some spaces are definitely premium with nice view of river and surrounded by grass. Others not so much. So look at the park map carefully and know what space you are getting before reserving a space. Unfortunately it appears that most of the premium sites were book through the summer by semi-permanent or long-term guests. In fact it appeared that many spaces were being used by long-term guests. Also if you are not into fishing there is little to do here. There are no trails along the river or nearby trails for bike, kids or to walk your dog. In conclusion this is a nice park and most people will be happy. But it could be so much better! For the price it is acceptable, yet still needs improvements. I do not feel it deserves a 10 out of 10… more like an 8.5 out of 10. 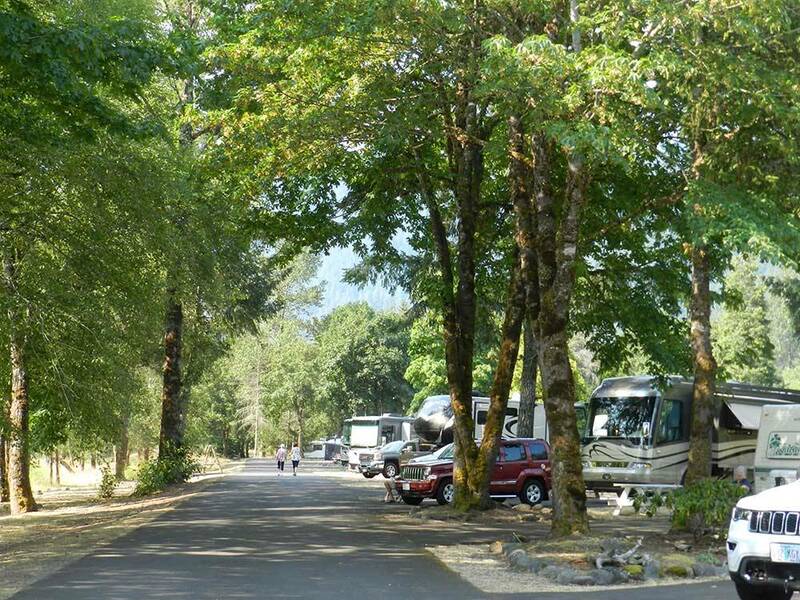 Beautiful Campground with Pull-Through sites overlooking the Willamette River. Some train noise, but masked by the sound of the River. Just West of Oakridge, OR off of Hiway 58. Full hookup sites with 30 and 50 Amp. Club house available for group outings, also an open air Pavilion with self service ice cream machine.